I made this yesterday for my guests, young and old, they loved it. This is like a Pavlova, however there is no crust. It has a soft marshmallow like base that melts in your mouth. To get it to be like that, as soon as it goes in the oven, you switch it off, then you leave it in the oven overnight, no peeking, don't even think to open the oven door, you simply forget about it until the morning. Hence forgotten. The recipe will say to use a swiss roll tin. Yesterday I just used a large baking tray, worked just fine, kept it's shape and was perfect. Preheat the oven to 220C. Grease and line with baking paper a swiss roll tin. In a large mixing bowl, whisk together on high speed the egg whites and salt until soft peaks begin to form. Keep the mixer going, now add the caster sugar slowly, one tablespoon at a time, until all of it is incorporated. Your mixture should now be stiff and glossy. With the mixer still going, add the cream of tartar and the vanilla. Spread the meringue mixture into your prepared tin, spread out evenly. Place it in the oven, close the door. Now immediately switch off the oven and leave it in the oven overnight. Don't open the door to check it. Just before serving, whip the thick cream until thick but soft. Spread it over the marshmallow meringue. 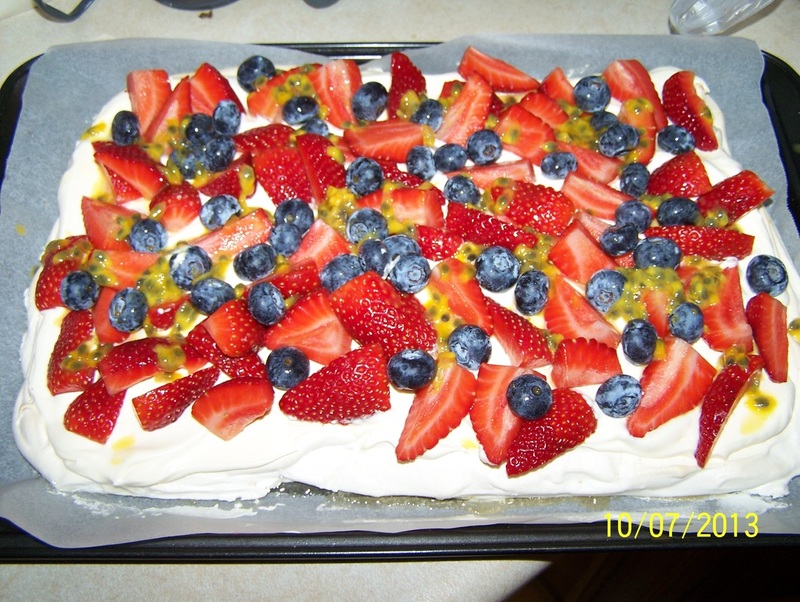 Dollop the passionfruit pulp and seeds over the cream. Top with blackberries or blueberries. In a medium mixing bowl, mix the strawberries with the extra sugar. Place over the cream filling in gaps.